"Direct observation of the luminous essence of nature is for me indispensable." Breaking free from Cubism to embrace brilliant color and representations of time and experience, Orphism introduced non-objective painting to French audiences. As one of the earliest styles to approach complete abstraction, Orphism brought together contemporary theories of philosophy and color to create works that immersed the viewer in dynamic expanses of rhythmic form and chromatic scales. Less than a long-term, cohesive movement, however, Orphism was a loosely bound group of artists with the common goals of moving beyond concrete reality to present a flowing vision of simultaneity and flux. It flowered briefly in the years leading to World War I, before fading with the rise of the war in 1914. From its inception, Orphism was interdisciplinary, integrating Henri Bergson's philosophical theories about time and experience with poetic experiments with symbolism and abstraction. The poet Guillaume Apollinaire coined the name, after the Greek god Orpheus who was renowned for his musical talents. Indeed, the artists of Orphism aspired to the levels of abstraction possible in music, where sounds were able to evoke emotions and experiences despite being disconnected from the real world. The Orphists arranged color harmonies after the model of musical scales and chords. Orphism was based in Cubism, but with a new emphasis on color, influenced by the Neo-Impressionists and the Symbolists. Unlike the monochromatic canvases of Pablo Picasso and Georges Braque, the Orphists used prismatic hues to suggest movement and energy. In emphasizing the sensory and intuitive, they provided radical new possibilities for the abstractions of Cubist ideas and created another path to the progression of modernism. Although no one is certain who created the first non-objective painting, the Orphists have a claim to this distinction. Between 1910 and 1912, several artists painted abstract canvases, including the Expressionist Wassily Kandinsky and the American Arthur Dove, although František Kupka, Sonia Delaunay, and Robert Delaunay all created works that are potential contenders. The competition is complicated: Sonia's abstract blanket design, which inspired her and her husband to paint abstract compositions, was not initially considered a work of fine art and both Robert Delaunay and Kupka painted designs based on subjects, making them not quite non-objective. Still, their inclusion among this elite group testifies to the importance of their avant-garde experiments. Believing that the color harmonies and radiating forms of Orphism represented universal energies, the artists moved beyond oil painting to experiment with more popular outlets. From poetry to design, some of the movement's most visible products were Sonia Delaunay's forays into fashion and décor. In fact, the movement's earliest and most daring abstract work was a textile created by Sonia, which then inspired painterly abstractions by her husband, Robert. Their broad definition of artistic production helped cultivate the idea of art as a total environment and further popularized collaborations between artists and industry. Around 1911, the theory and practice of Robert and Sonia Delaunay began to converge with the experimental work of František Kupka, giving birth to Orphism. The notion of Orphism was popularized by Robert Delaunay's influential article of 1912, "La lumière" and Guillaume Apollinaire's description of "Orphic Cubism" in his 1913 writings on modern art. The collaborations between Robert and Sonia Delaunay broadened the range of Orphism beyond the art world. The Delaunays would become most closely associated with Orphism, even though Kupka received some of the earliest acclaim for his advocacy of pure painting, abstract and free from any need to be descriptive. This non-objective ideal broke with even the most radical painters of the time, who abstracted from nature, but still worked from identifiable sources. 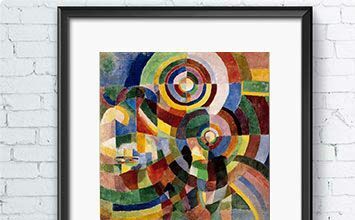 Delaunay considered this monumental painting (13 x 9') a turning point in his work, and suggested a larger, metaphysical continuum of time and experience. Intended to be a visual manifesto, he incorporated elements of modern fragmentation while juxtaposing them with classical allusion and historical scale. The work combines fragmentary views of Paris and elements of its history, beginning on the left with the Quai du Louvre, representing ancient Paris, and, ending on the right with the Eiffel Tower, symbolizing the city's modernity. Reflecting Orphism's emphasis on depicting modernity's simultaneous states of being, this work conveys the fleeting sensations of modern life in Paris. He had first explored imagery of the Eiffel Tower in 1909, and it was to become a central symbol in his work. Delaunay also added the symbolic layer of the three women; their fragmented figures represent Paris of the past, the present, and the future while alluding to the Greek myth of the Judgment of Paris. The women were partly inspired by a wall painting of the three graces from ancient Pompeii. The large scale and the use of allegorical figures show Delaunay intended the work as a kind of tour de force, proclaiming his departure from Cubism with its exhibition at the 1912 Salon des Indépendants. The brilliant Orphist color palette, based in contrasting primary and secondary hues, creates a sense of vibrant movement and simultaneous sensation. Delaunay believed this offers another level of significance, beyond concrete reality. As Apollinaire wrote, "more than an artistic manifestation. This picture marks the advent of a conception of art lost perhaps since the great Italian painters...he sums up, without any scientific pomp, the entire effort of modern painting." The patchwork blanket, made of 70 triangular and rectangular pieces of cloth, is arranged in contrasting patterns along a roughly designed grid, creating a softly harmonious but dynamic effect. The dominant horizontal and vertical lines are counteracted by triangular patches, which introduce subtle diagonals to provide a sense of vibrant movement. The arrangement of black rectangles, green triangles, and small vertical rectangles of yellow in the center of the work create a sense of depth, as if looking into deeper space, yet the textile remains an insistently flat surface, creating visual tension between illusion and reality. Although this work would serve as a foundation for Orphism, its origins were relatively humble. Sonia Delaunay explained that, "About 1911 I had the idea of making for my son, who had just been born, a blanket composed of bits of fabric like those I had seen in the houses of Russian peasants. When it was finished, the arrangement of the pieces of material seemed to me to evoke cubist conceptions and we then tried to apply the same process to other objects and paintings." The quilt's status as a domestic object and not fine art made it more possible to experiment with pure abstraction; the stakes were lower and it was acceptable to pursue patterns and colors in a purely decorative fashion. This early Orphist work informed the movement's theory and practice, as it inspired her husband's series of Simultaneous Windows. In truth, Sonia's work is the more advanced: Robert's series retained some figurative elements, while the blanket is totally an abstract arrangement of colors, shapes, and lines. Despite its utilitarian origins, once her son had outgrown the quilt, Sonia framed it and exhibited it among her earliest abstract tableaux. This work, depicting Adam and Eve in Paradise, marked the young Baranoff-Rossiné's debut as a modernist and demonstrates his early adoption of Orphist ideas. Like Delaunay, he intended the painting to make a grand demonstration of the meaningful potential of harnessing color and form to make meaning; he incorporated traditional symbolism, quoting Old Master works, to underscore its ancestry. Indeed, Adam's posture and profile alludes to Albrecht Dürer's 1504 Adam and Eve, but, unlike Dürer, the artist portrays Eve as a supine and seductive being, accompanied by a cat which symbolizes sexuality, drawing from more recent fin-de-siècle iconography of the femme fatale (Adam is attended by a faithful hound). A solar disk swirls at the center of the canvas, and six rings radiate around it, representing the Biblical six days of creation. The vegetation growing out of the third ring creates a sense of vibrant growth, in which can be seen fragmentary and amorphous animals. Baranoff-Rossiné's s use of the allegorical and the cosmological was influenced by Delaunay's allegorical figures in La Ville de Paris, as his solar disk alludes to his mentor's emblem. Nevertheless, the artist uses the allegorical with a different intent, creating not the sensation of modern reality, but a symbolic paradise, a world newly generated out of the rhythm of light, where the dynamic solar disk represents the eye of God. In 1910 the young Ukrainian artist moved to Paris where he met the Delaunays, who became his mentors at the moment when they were developing the theory and practice of Orphism. Showing his interest in Orphic color and dynamic structures, this painting debuted at the 1913 Salon des Indépendants, the height of the movement's popularity. This view of Paris, centered on the Eiffel Tower, recognizable as a green silhouette, appears throughout Delaunay's Simultaneous Windows series. Conveyed in translucent, overlapping, and contrasting color planes, the window serves as a framing device and a way of overlapping interior and exterior spaces in the painting. The influence of Symbolism can be seen in the artist's use of the Eiffel Tower as a symbol of modernity, and also in his use of windows, as Symbolism used images of glass to symbolize the connection between internal and external realities. Although the work was based on a photographic postcard, it also shows the influence of Sonia Delaunay's quilt in its grid-like pattern of rectangular and triangular planes. The Simultaneous Windows paintings were a breakthrough for the artist, helping to differentiate him from other Cubists; as he explained, they were "in reaction to the academicism and confusion of early Cubism." While the influence of Cubism can be seen in the use of multifaceted planes, his emphasis on structuring the work through blocks of vibrant color, rendered here in vibrant translucencies was radically different from his colleagues. The name of the series refers to Chevreul's idea that the eye perceives contrasting colors simultaneously and it also references Bergson's ideas on the structure of time and experience as a continuum. Looking at the work, the viewer's focus shifts between the forms and the planes of color, drawn by the relationships between the hues. Color becomes structural in the work, and the painting itself becomes a window, where all the elements are present simultaneously, but harmoniously. In this work, the artist uses a highly simplified palette of blue, red, black, and white, combined in a series of arabesque patterns. The simplicity of the work is, however, misleading; Kupka made 27 preliminary studies for this work. His earliest sketches from 1907-1908 were representational, depicting a girl making a circling motion with a ball in her hand. Over time, he focused solely on her movement making the result increasingly abstract. To a viewer unaware of the preliminary drawings, the painting would appear completely non-objective. Indeed, when the work debuted at the 1912 Salon d'Automne, it generated controversy as the first abstract work shown in Paris. Its limited color palette was also shocking, as Kupka interwove red and blue in curvilinear ribbon patterns to give the colors the quality of melodies in a fugue. The red and blue arabesque's fluidity between plane and line and between background and foreground has the effect of movement and depth. As the title suggests, he felt that pure painting was analogous to music as "the sounds evolve like veritable physical entities, intertwine, come and go." Robert Delaunay joined Der Blaue Reiter in 1911 at the invitation of Wassily Kandinsky. Orphists and the Expressionists both argued for the evocative and dynamic use of color and form, thus their approaches to painting were highly compatible, cross-pollinating between Delaunay and some members of Der Blaue Reiter. And Marc, along with Paul Klee and August Macke, visited Delaunay's Paris studio in 1912. Marc's work primarily focused on animals, which often represented spiritual qualities he found lacking in the modern world. Centered in the canvas, the bull reflects both Kandinsky's color theory that blue had the highest spiritual resonance, and Marc's own association of the color with masculinity. Reflecting the influence of Orphism, Marc presents the animal and its surroundings in a rectangular pattern, suggesting a grid of overlapping planes. A structure of opposing colors, particularly around the bull's head and body, create a feeling of harmony between the creature and its environment. The contrasting curvilinear shapes evoke the natural and organic world while contributing to a sense of energy, that is powerfully at rest. Demonstrating Orphism's interdisciplinarity, this work was a collaboration between Sonia Delaunay and the poet Blaise Cendrars. More than just an illustration, Delaunay's swirling colors create an analogue to the poem, which describes a journey on the Trans-Siberian Railway during the Russo-Japanese War and the Russian Revolution of 1905. Marketed as the "first simultaneous book," the work begins at the top with a Michelin railway map of the journey; it ends with an image of the Eiffel Tower in red. The tower was integrated into the construction of the work, as well: the poem was printed on four panels of paper that were accordion-pleated to form a small booklet of 22 pages. The initial print run of 150 copies, if all booklets and pages were laid end to end, they were calculated to measure the exact height of the Eiffel Tower. A number of scholars have questioned whether Cendrars ever took his journey, or if it was entirely mythical, meant to rival the great French poet, Arthur Rimbaud's imaginative journey in L'bateau ivre, (The Drunken Boat). When asked about the actuality of the trip, Cendrars would only reply that accuracy was unimportant, what mattered was that he had made the reader experience it. Delaunay's painting was integral to that sensorial quality; the two collaborators explained, "The simultaneous contrast of colors and the text form depths and movements of novel inspiration." Apollinaire introduced Cendrars to the Delaunays in 1912 and, by autumn, Cendrars was staying with the couple. He credited the development of his poetic practice to their idea that, as Robert Delaunay said, "Everything is color in movement, depth." Accordingly, the poet incorporated the visual into his text, using 12 different fonts, different sizes of text, and colored font. In turn, Sonia Delaunay wanted to translate the words into color, and so used irregular shapes of contrasting color to create a feeling of speed and disorientation. The reader's eye is constantly moving between the poem's dark subject matter and a brilliant field of color. Cendrars later described the work as "a sad poem printed on sunlight." The first work to explore Orphism's use of contrasting colors on a monumental scale, this twelve-foot long painting depicts a view of dancers and dancing couples under the dome lights of a Parisian dance hall. The dancers are fragmented into bright abstract areas of color, and the contrasts of red against green, purple next to yellow, create a swirling and energetic effect. The background is depicted in larger swathes of contrasting color, and the dome lights, haloed with concentric rings, resemble the emblematic solar disks of Robert's contemporary paintings and point toward Sonia's subsequent abstraction, Prismes electriques. The Delaunays frequented the Ball Bullier dance hall, a gathering place where the literary and artistic avant-garde would convene - and dance the tango, the latest craze. Here, Sonia draws upon her experience to capture the energy and excitement of the scene and the dancers, swirling through a world of inner and outer sensations. Her triangular and rectangular planes are not uniform but curved, resembling pieces of fabric; the effect of this curvilinear approach is rhythmic, so that the whole room seems to dance. This work is electric with color, radiating from the two large circles at the center. The concentric rings and arcs are depicted in contrasting primary and secondary colors that overlap and become prismatic. In the rest of the painting, partial circles like halos cast by a light are broken by geometric patches that convey glimpses of the sidewalk beneath, at the lower right, and a building in the center left. This fragmentary landscape has been engulfed and dwarfed by a larger dynamic realm of sensorial color and pulsating form. The work builds on the roots of Orphism found in Robert Delaunay's earlier Neo-Impressionist Paysage au disque (1906-1907). In that painting, he adopted an icon of the sun, represented by a disk with concentric rings, as a personal emblem. The radiating orbs of Sonia's painting, nearly a decade later, demonstrate the couple's enduring desire to use color to structure painterly space in order to express contemporary experience. In this example, both Sonia and Robert found the newly installed electric streetlights in Paris to be fascinating; here she conveys not only the glow of the lamp but the exciting sensations of new technologies and frenetic nightlife.